Obituary for Mary Jean Washburn | Lanman Funeral Home, Inc.
Mary Jean Washburn, 88, went to be with the Lord Thursday, March 21, 2019 at Kiowa District Manor Nursing Home in Kiowa, Kansas. Funeral service will be Friday, March 29, 2019 at 1:00 p.m. at First Baptist Church in Cherokee with Rev. Garry McNeill officiating. Arrangements are by Lanman Funeral Home, Inc. of Cherokee. Burial will be at Cherokee Municipal Cemetery. Viewing will be come and go on Thursday from 10:00 a.m. until 6:00 p.m. www.lanmanmemorials.com Facebook: Lanman Funeral Home Inc.
Mary Jean (as she was affectionately known) was born December 16, 1930 in Cherokee at the Masonic Hospital to Jack Kubricht and Rosemary Lagrone Kubricht. 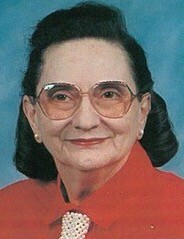 She grew up and graduated from Cherokee High School, class of 1948 as salutatorian. She worked at the phone company as a nighttime operator until 1955. She then married C.E. Washburn and moved to Ponca City. She continued working at the phone company for a time and then went to work for Rentschler’s Office Supply. In 1962 she and C.E. had a son, George Nicholas. She then became a stay at home mom and in 1967 she and her family moved to Ft. Smith, Arkansas, where C.E.’s job took them until 1974. She then moved with her family to Tyler, Texas and remained there until September of 1988. After becoming a widow, Mary Jean moved back to Cherokee to live in the home where she had grown up. She enjoyed her later years by taking care of her home, visiting with all kinds of people she would come in contact with and watching her grandson grow up throughout the years. She always had an enjoyment for life in general: sunshine filled days, water colored sunsets and moonlit nights. She was a woman of integrity, loving hard work. She loved the Lord and always followed the Golden Rule. She had an endorsement as Master Director from A.C.B.L. (American Contract Bridge League), as she was an accomplished bridge player. She was a member of PEO, Eastern Star, Daughters of the American Revolution (DAR) and U.C.T. She was preceded in death by her parents; her husband, C.E. ; sisters, Rose Marie in 1994 and Esther Mae in 2003’ and nephew, Kent Anderson of Mooreland. She is survived by one son, George N. Washburn and wife, Cheryl of Cherokee; grandson, Collin and wife, Calli of Tulsa and her “little” “grand pugs” whom she also adored. Memorials may be given to Heartland Hospice of Wichita through the funeral home.